$1.99 to $169.99 & FREE Shipping on orders over $59 $35. 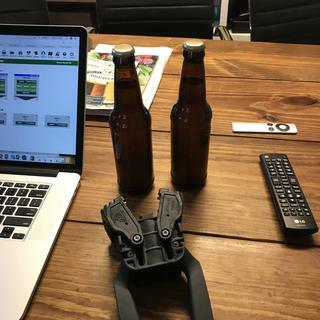 Commercial quality beer bottle caps to keep your brew safe and sound from bottling day until you're ready to enjoy it. 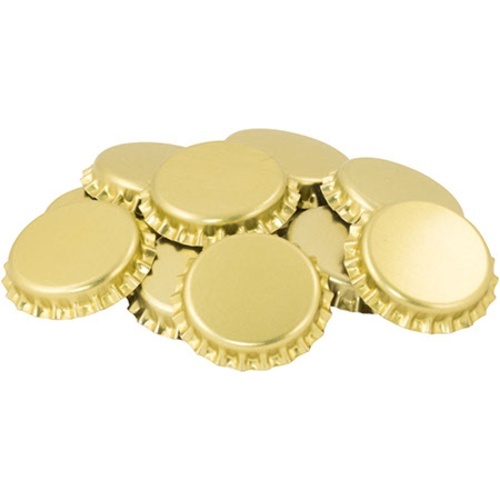 You will get a good firm seal that will last through transport, gift giving, and storage with these gold bottle caps. These bottle caps crimp down onto the beer bottle and make a firm seal. They don’t rust or leak and they contain an Oxygen absorbing agent in the liner, which means you won’t get any unwanted oxidation. A good value for a great product. Less that what I pay at my local brew store. So I can write on the top. Need caps, and oxygen absorbing seems like a better way to go. Good price on decent caps. Best. Used them for years. They are oxygen absorbing caps. best all-around caps I've used, good price, too! I need bottle caps and these have worked well. If you sanitize these with Star-San right before capping (say 5-15 minutes) does the oxygen absorbing still work? Or do you have to use them unsanitized? And do you no longer carry non-oxygen-absorbing bottle caps? 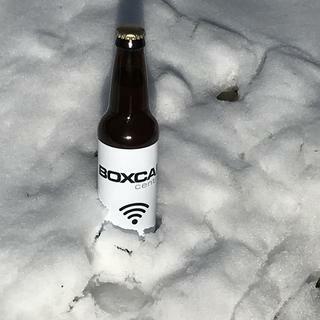 BEST ANSWER: In addition to the excellent information provided here, I would like to add an excerpt from the patent filed for the oxygen absorbing gasket in beer caps: "In a patent directed to beer packages (Hofeldt and White, 1993a), the developers indicate that the same oxygen absorbers in the same polymeric matrix are activated by thermal pasteurization or sterilization. Although the relative humidity in the headspace of a beverage-containing bottle or can is generally sufficiently high to activate the scavenger, the reaction could be accelerated by heating to increase moisture permeation into the scavenger mix. Thus, they suggest a scavenger that remains effectively inert until pasteurization or sterilization. Moisture generated from the interior contents permeates into and becomes trapped within the gasket to accelerate the oxygen-removal reaction. Oxygen trapped in the headspace and that permeating into the bottle through the gasket are both reacted with the scavenger." In other words, it is not required to submerge them in water before capping, because the relative humidity inside a capped bottle is sufficiently high to activate the oxygen absorption. In addition, boiling the caps will not destroy the oxygen absorption properties, because they are designed for thermal pasteurization. I would still advise using them right after sanitizing, as others have suggested. The oxygen-absorbing compounds are activated by water/sanitizer, but contrary to what a lot of people assume, they do not get "used up" immediately after activation. The caps are designed to absorb oxygen slowly over the next day or two after being activated. So yes, you should sanitize these like any other bottle caps (5-15 minutes should not make a difference in their effectiveness), just don't sanitize them and then leave them around for days before bottling. Nice caps, haven’t had any bad seals. Pretty plain looking but gets the job done. I have been buying these caps for years, and always had a good experience. However, my last purchase resulted in receiving caps different from what I had received in the past. The caps used to be more of a brushed gold, and worked very well. These new gold caps are very shiny and do not set very well on the bottles. In fact, a bottle with the new shiny cap fell over in a box, and the cap became dislodged and beer started flowing. I assume it is a new manufacturer, or a defective product. Either way, I will not buy again. I guess I will have to pay more for the colorful caps. They work and the price is right. Hooray! These caps always keep my beer flavor fresh, they are easy to mark my beer style. cap some beers off my keg for sharing sometimes and these work as you'd expect. These are excellent bottle caps, never had any leakage or flat beer. Bottled a 5 gallon batch 2 weeks ago using these caps. They seated very well and created a good seal. I like that I can write a date on the cap. Good product so far. Will see how they performed after I open a couple bottles next week.